SBIDC received a Brownfield Opportunity Area (BOA) grant from the New York State’s Department of State (DOS). The grant allows SBIDC to create a revitalization plan for approximately 343-acres in Red Hook, Brooklyn. This area extends from Hamilton Avenue west to the waterfront, and encompasses the entire Industrial Business Zone (IBZ) in Red Hook. It has a high concentration of brownfields and was heavily impacted by flooding from Hurricane Sandy. 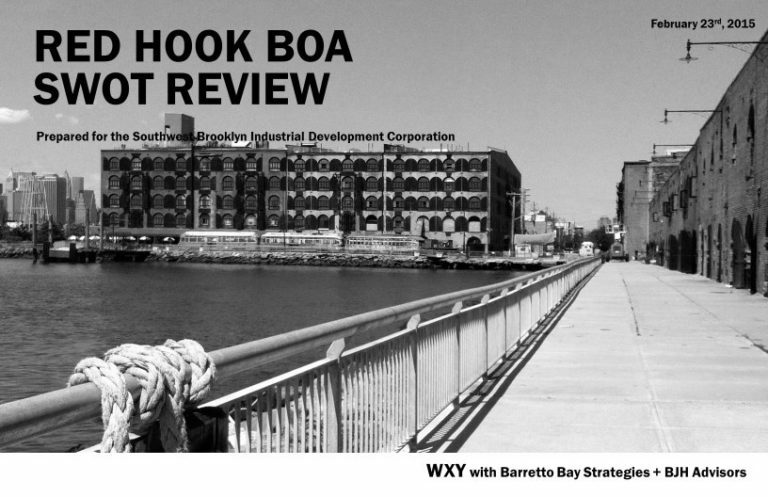 The Red Hook BOA provides an opportunity to delve into the long-standing issues that affect brownfields and pursue a fine-grained economic examination of the future of Red Hook’s industrial area. As part of the Red Hook BOA process, we conducted an Economic Analysis of the Red Hook industrial area. Click the image below for the full report. SBIDC implements economic development initiatives to help foster cohesive and healthy commercial corridors in Red Hook. Since 2005, SBIDC has helped create a consistent streetscape along Van Brunt Street while reducing commercial vacancies. Our efforts have enhanced the feel and look of Red Hook’s main commercial corridor. This activity has been supported by the Red Hook Main Street Program with the New York State Department of Housing and Community Renewal in addition to the New York Storefront Improvement Program with the Department of Small Business Services. SBIDC currently implements a Business Attraction program through the Department of Small Business Services Avenue NYC program. Our efforts are focused on Van Brunt Street, Lorraine Street and Clinton Street. Our business attraction activities include broker breakfasts, market surveys, real estate assistance, and business attraction events. Because of our longstanding work in Red Hook, SBIDC understands what businesses and residents want and need on their commercial corridor. This information guides our economic development strategies, and we therefore try to attract the appropriate businesses to vacant commercial properties. 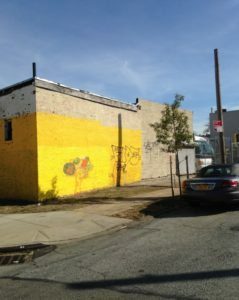 Are you a business look to relocate or expand to a commercial corridor in Red Hook? Contact Jesse Solomon at jsolomon@sbidc.org or 718-965-3100 x 114 for more information. SBIDC promotes Red Hook’s businesses to visitors and local residents through our placemaking campaign. We publish the Red Hook Neighborhood Guide & Map to help draw foot traffic to the commercial corridors. We also host a street fair called Red Hook Walks on Van Brunt Street in the summer to activate the street in a creative way that reflects the neighborhood’s identity. Because of our community focused mission, we include resident and business owner participation in all of these programs. 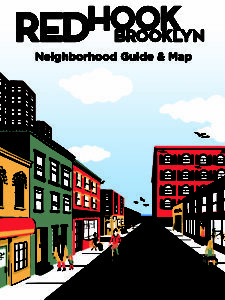 Download the Red Hook Neighborhood Guide and come explore all that Red Hook has to offer! SBIDC received an Neighborhood Innovation Challenge Grant to investigate the feasibility of developing a ground-up light manufacturing center in Red Hook. The final report compiles a series of discussions among relevant stakeholders, and outlines recommendations to revitalize an underutilized lot on 41 Richards Street. We recommend that the lot be developed into a light manufacturing center that would house approximately 30 small manufacturing spaces. This would create upwards of 125 high quality jobs. SBIDC has a robust workforce program, and could help neighborhood residents access these jobs. The realization of this project would transform an 12,500 square foot lot and set the stage for a newly revitalized Richards Street industrial corridor. If you have any questions, please contact Jesse Solomon at jsolomon@sbidc.org or 718-965-3100 x 113. After the devastating effects of Hurricane Sandy in October 2012, SBIDC with support from the Port Authority of New York and New Jersey created a Small Business Storm Resiliency Program to protect small businesses of all types against similar events in the future. Engineers from Dewberry Inc. worked with three typical business types in Red Hook, Brooklyn as case studies to identify mitigation measures for their buildings and provide emergency preparedness plans for their business operations. At the links below, access your own emergency preparedness planning template and the findings from these cases studies to uncover general and specific mitigation recommendations that can apply to your business. Please contact Jesse Solomon at jsolomon@sbidc.org or 718-965-3100 x 113 for assistance completing a storm preparedness plan and to receive hard copies of these invaluable resources.